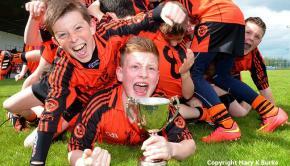 Our U-14 footballers started their league campaign with a 2pt. 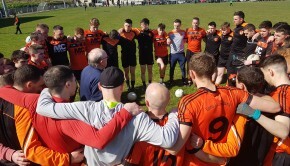 victory away to Dungiven on Tuesday evening. With a strong wind favouring Lavey in the first half, our boys played some tremendous attacking football and were rewarded with points from Enda Downey, Patrick McCrystal and a long range score from excellent mid-fielder Ronan Rafferty. Thomas Donnelly and Fintan Bradley were giving the Dungiven defence a torrid time in Laveys half forward line, and after good work from full forward Peter Rafferty, the clever Thomas Donnelly got in on the scoring with a brilliantly taken goal in the 15th min mark. Dungiven came back with a point but Thomas Donnelly scored an even better goal moments later, to the top corner of Dungivens net, after being put through by the hard working Oran Downey. Unfortunately for the young Erins Own lads, Dungiven scored a very fortuitous goal on the stroke of half time when an effort for a point hung in the breeze and dipped under our bar for a goal. Things could have been worse however, but for a brilliant point blank save from goalkeeper Paudie Duggan who pulled off a brave reflex save when confronted with the Dungiven full forward being straight through on goal. This left the half time score Lavey 2-3 Dungiven 1-1. Laveys defence was going to be tested for the second half but with Lee Tsang outstanding at corner back, he repelled most of Dungivens attacks himself! The strength and athleticism of full back Nathan Scullion and corner back Eoin Laverty meant Dungiven were restricted to just 2pts in the first 15mins of the second half, which reduced the arrears to a goal. Ciaran Hendry scored a brilliantly worked point for Lavey as he attacked from his position of wing half back to get on the end of a 10 man move that was started by goalkeeper Paudie Duggan and carried deep into scoring range by the excellent lung busting efforts of mid-fielder Ryan McCloy. Dungiven hit back with a goal to leave just a point between the teams with 5 minutes left. With our backs to the wall, strong centre half back James Crawford took ball after ball out of our defence to relieve the pressure. 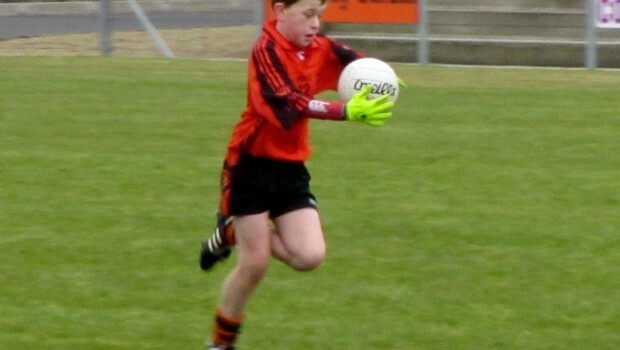 With time almost up wing half back Ryan Mulholland carried the ball deep into Dungiven’s half and fed corner forward Enda Downey, who is still a P7 pupil, and he did the rest by sprinting away to score a valuable point to put 2 between the teams. A nervy 4 minutes of injury time saw our lads remain resolute in defence and a fully deserved victory was greeted with satisfaction at the final whistle. A great team performance from a smashing group of young footballers! 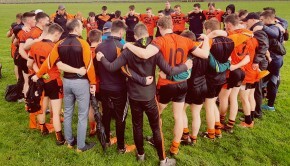 Their next game is on Tuesday 21st May, at home to Swatragh.